Tuitions vary according to our costs and the length of the course. You will find the tuition amount(s) printed below each course description. We ask you to deposit one-half of your total costs along with your application. The balance due must be paid one month before class begins. Your deposit, less a $100 fee per course, will be refunded in the event that you must cancel and do so at least one month prior to the beginning of the course. Deposits will be refunded in full to students who cancel three business days after registering for a course. If your notice of cancellation is received between 15 and 30 days prior to the course, your tuition is not refundable, but can be credited toward future courses later in the season. If you must cancel less than 15 days before the course, we cannot refund or credit your money. 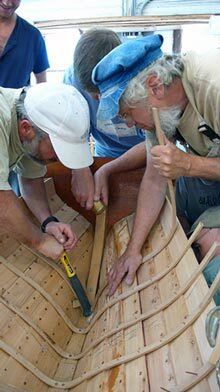 In case of emergency or insufficient number of registrations, WoodenBoat School reserves the right to cancel a course and return all deposit money. Because of this policy, we strongly urge you to buy refundable airline tickets or flight insurance. WoodenBoat School will not be responsible for any loss on nonrefundable airline tickets. Current full-time high school and college students are eligible for a discount of 50% off the listed course tuition for classes in Brooklin. There is a 10% discount on tuition for most classes for all alumni. The School has a one-third tuition scholarship available for all courses in Brooklin. These are awarded to people who could not otherwise afford to participate in our courses, with preference given to people who are working in the marine trades and to students contemplating a career in the marine industry. Scholarship recipients will be assigned periodic tasks in the shop, in the kitchen, and on the waterfront. 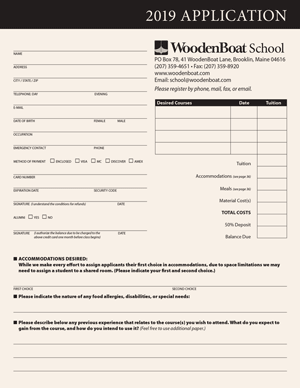 Note: Most WoodenBoat School programs are GI Bill® approved. GI Bill® is a registered trademark of the U.S. Department of Veterans Affairs (VA). More information about education benefits offered by VA is available at the office of U.S. Government Web site at https://www.benefits.va.gov/gibill/.